Fig. 3 is a doozey; the “X” has a coefficient. But don’t panic! You are in control. Numbers don’t control you. The same steps apply. Remember, you can cross-multiply the remaining numbers. 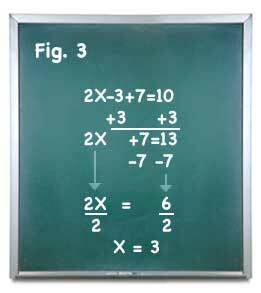 The college algebra tutorial presented is just to get your feet wet with algebra, again. I haven’t covered multiplication, division, lowest common factors, square roots, trinomials (eek!) and a host of other mathematical problems. The Cliff’s Notes Algebra I guide will explain them all in detail. 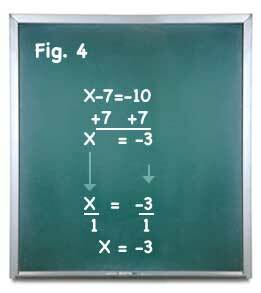 I am no college math wizard–I’ll save that for the math experts–but most likely, you will have to take at least one math class to earn your college degree. • When creating the sum of two or more positive numbers, add the numbers and give it a positive sign. Reverse the process for negative numbers. • When creating the sum of negative and positive numbers, subtract the numbers and the sum takes the sign of the highest number. In Fig. 4, 10 is the highest number.